Here is a great article from one of my favorite authors, Brian Tracy. This brief talk on character and integrity was inspiring. I believe that Applying simple yet effective concepts in leadership and personal development over time can have a huge impact on both our personal and professional lives. Enjoy. Earl Nightingale once wrote, “If honesty did not exist, it would have to be invented, as it is the surest way of getting rich.” A study at Harvard University concluded that the most valuable asset that a company has is how it is known to its customers>its reputation, especially for honesty and quality. A key to developing integrity and character in yourself is to study men and women of great character. Study the lives and stories of people like George Washington, Abraham Lincoln, Winston Churchill, Florence Nightingale, and Susan B. Anthony. Study the people whose strength of character enabled them to change their world. You can do the same thing they would do. Select someone who you very much admire for their qualities of courage, tenacity, honesty, or wisdom. You will find yourself receiving guidance that enables you to be the very best person that you can possibly be. 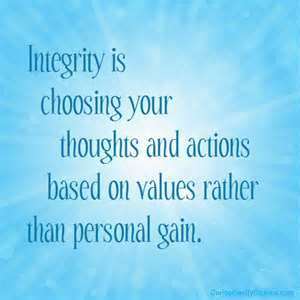 Your integrity is manifested in your willingness to adhere to the values you hold most dear. It’s easy to make promises and hard to keep them, but if you do, every single act of integrity will make your character a little stronger. Second, keep your word. Keep your promises and commitments. Always do what you say you will do and guard your integrity as a sacred thing.